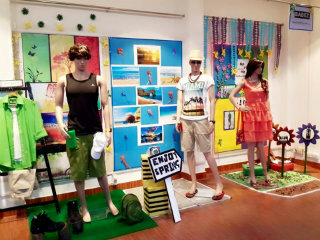 As a part of Visual Merchandising module, students of PGDM- Retail & Marketing created a Window Display on 20th April 2015. 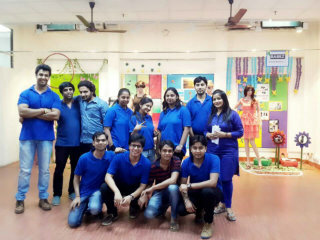 The activity was exceuted in the VM Lab of the college. All the students were divided into groups of three and was given a common theme to work on. 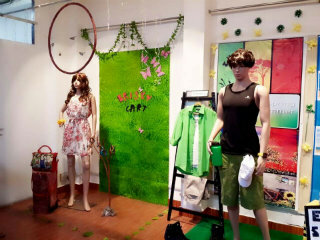 The Theme was Spring Summer and each group selected a category ie. Women's wear or Men'swear. Each group had a restricted budget of Rs. 2000 for sourcing material and props ( excluding products). First stage of this display was submission of a planogram which is a rough sketch of the display. Second and final stage was to set up the display as per the planogram in limited time frame( four hours). Students were required to submit cost sheets too. Students enjoyed and understood the importance of sourcing ( within budget), material exploration, color aesthitics and challenges in practical execution of display design. 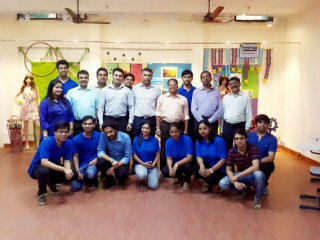 The work of students was appreciated by respected Dr. J.K Goyal, Director, JIMS, Dr. Sumesh Raizada, Dr. Ashok Bhagat, Dr. Goswami, Mr.Manpreet Singh, Dr. Ritu Bajaj, Mr. Sumit Anand, Mr. Shiv Anand and other staff members.This activity was conducted under the guidance and mentorship of Ms. Surbhi Jain, VM Faculty and HOD for PGDM- RM programme.